Adventure stories filled with danger, action, and unusual events have been popular with readers from ancient times to the present day. 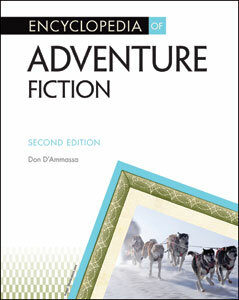 The new A-to-Z Encyclopedia of Adventure Fiction, Second Edition, covers the very best of adventure fiction, from literary classics such as Charles Dickens's A Tale of Two Cities and Joseph Conrad’s The Secret Agent to tales that have enthralled younger readers for many years, such as Treasure Island and The Wizard of Oz, to the finest of today's adventure stories. Written by a well-known writer of horror and science fiction, this essential reference to the great works and writers of adventure fiction is sure to delight and intrigue any reader. This new revised edition contains updates to the biographical entries of all active writers in addition to updated bibliographies in the appendix. Stories, such as "The Most Dangerous Game" and "The Lady, or the Tiger?" Topics, such as Arthurian adventures, espionage, and pulp heroes.